Emotional intelligence is something people hardly recognize in past business culture, but now the time has changed and it is proven in research that, the people who are emotionally intelligent are great leaders as compared to those who lack in the department of emotional intelligence. People may get confused when they hear the word emotional intelligence, but it is a well-known term and most of the great leaders acknowledge the power of emotions. The emotional intelligent people understand not only their own emotions, but also have a soft heart and understanding of others well, and they are far too happier in their professional workplace than a person who lacks emotional intelligence. 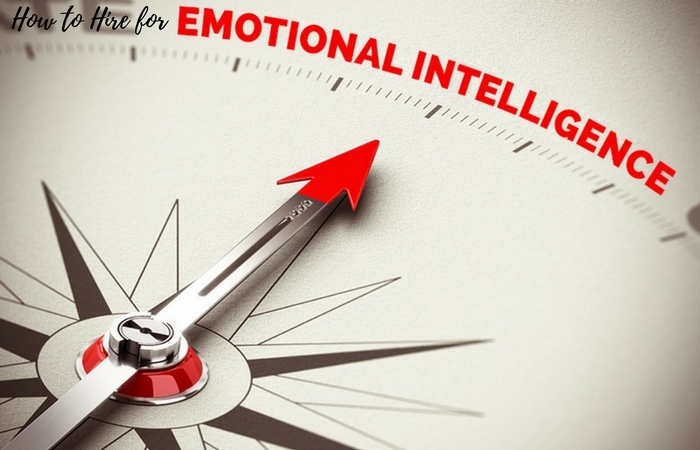 So what is emotional intelligence and how to hire for emotional intelligence? Emotional intelligence is the capacity to be aware, to control, to understand and express one’s emotion, handle the interpersonal and professional relationship emphatically and judiciously. In simpler words, emotional intelligence is the term used when a person can understand their own emotion and others and use them in a right way to utilize in good thinking, behavior and guide them. There are researches that have shown that emotionally intelligent people are far too understanding, successful and have good leadership quality because they are emotionally rich and understand others on a very emotional level. Many types of research contradict with the theory of emotional intelligence and its impact on personal as well as in professional life but the actual fact is that emotionally understanding people are far happier in their life than less emotional people. Why do we need Emotional Intelligence in the Workplace? The theory of emotional intelligence is still having some question or contradiction, but one fact is clear from all the research that emotions are a great part of human life and we cannot function well without the emotions. The concept of emotional intelligence is also important in recruitment because nowadays recruiter only want paper success like best school, best marks, best academy record, but somewhere in this race of best, emotions stays on the back foot which causes emotional instability and people in their job behave emotionless and are less happy due to this. One of the main reasons we see less emotional and more practical people in the workplace is because we never do recruitment for emotionally intelligent people, but for those who have the best academy record so far. This ultimately makes the workplace a battlefield where everyone is playing for a win. Emotional intelligence makes people more compassionate towards their colleagues, they understand each other at some level and motivate as well as work like a team without making it a chance to get the brownie point. Emotional intelligence is the second mantra of success; of course, hard work is on the top. Now we know how important it is that the new employees are emotionally intelligent but the main question is how to hire for an emotional intelligence? Hiring for emotional intelligence is not the easiest of task and recruiter often gets confused over the fact that how to hire for emotional intelligence because they have no idea of such concept. They never taught the role of emotion, their positive and negative impact as well as how to hire for emotional intelligence. Obviously, the need for smart, understanding workforce is far important than checking the emotional intelligence of existing employees, but we still need experienced and smart people in our team. We need a team who understands and motivates others and balance positive and negative energy at the workplace so that everyone can do their best, but the main issue is how to access the EI of the candidates who had applied for the job. We never taught how to test Emotional Intelligence (EI), but there are some steps you can take to check the emotional intelligence and know how to hire for emotional intelligence. It often happens that interviewer conducts interview that is totally based on the need and requirement of the job and they only focus on the interviewee qualifications and intelligence. The hiring process is like a game where the chances of a hit and miss are equal. It is possible that highly qualified and intelligent candidate leaves frustrated colleagues and unsatisfied client and proves to be a disaster decision that’s why it is necessary to include emotional intelligence in the interview. Use behavioral interviews to know the level of emotional intelligence of the candidate. Emotional intelligence is not something you can know by reading a report card, but it shows through reactions, decisions, and behaviors. Ask a question about some hypothetical situation and observe how they react to the situation and take examples from the past. Questions that show the behavior of the candidate are ideal for a behavioral interview and the interviewer can easily understand the emotional intelligence of the candidate, but this is just the first step towards the EI hiring. The Interview is a tense situation where most interviewees show nervous behavior, but it can easily sort out if the interviewer knows how to take control of the situation and make the interviewee comfortable in the environment. A comfortable interviewee is easy to understand and chances are they behave according to their natural behavior rather than nervous babbling or reaction. A comfortable environment is ideal for a productive interview as well as to know interviewee emotional intelligence. It is necessary that candidates are comfortable enough to show their true behavior because interviews are those occasions where people tends to show what interviewer is looking for rather than what they truly are. Interview are one of those occasions where everyone wants to show their best. There are no surprises left in interviews because of the internet, and availability of information at the tip of the figure. People are smart enough to prepare well for the interview and show exactly what the interviewer wants to know. A smart interviewer knows and works hard before the interview to prepare, but emotional intelligence often put them on the back foot, because most managers think of it as unnecessary quality. In recent years emotional intelligence of the potential employee is regarded as one of the important qualities for the job, but the interviewer is still less educated on how to check the emotional intelligence of the candidate. Another best way to check the emotional intelligence is to closely observe the behavior of the candidate during the interview. Smart interviewers ask probing questions and then observe their interviewee to know exactly how they react. Understand how they react in a particular situation and how they approach when certain problems arise or their thoughts about their previous workplace because how one person reacts to the situation, depends on their level of emotional intelligence. Every organization has own culture, ethics, and values when it comes to working, similarly, every individual has his own work ethics and values as well as working style which may suit to some organization but not with others. Emotional intelligence also plays important role in the working of a candidate in a particular environment because lots of situation demands patience, understanding, and hard work from their employees. It is always good to crosscheck that the candidate fits your work culture because it’s going to create a huge mess if not. Emotional intelligence makes a person react maturely towards the situation and a person with good EI understands others emotion as well. So when hiring a person for emotional intelligence, always crosscheck that the candidate fits in your work culture as well as going to be an asset to the organization rather than a burden. You cannot always predict, how someone is going to behave in coming six months or one year but you can take necessary precautions. Emotional intelligence is not only measured by how they behave at the workplace but also how they behave in a situation other than work. There are people out there who are great at work, but their behavior outside is as poor as anyone can imagine and it often creates problems in workplace too because you cannot change how people react with each other in a few hours. A good interview gives importance to the emotional intelligence and always involves a conversation about the extracurricular activities of the interviewer and what they do other than work. You cannot predict the emotional intelligence of a person by just the behavior of the person at work and how they do their work. The Interviewer needs to know more about what they do other than work and how they react to the situation that occurs outside the work environment. Emotional intelligence does not only about knowing own emotions and others at work, but it is about the overall understanding of a person and how they understand others and their own emotions. A person who has emotional intelligence always tackles personal problems with grace as well because they tend to know the feelings and expectations that came with the feelings. An employee can be good if he/she is a good human being and understand others as well. Giving reference in a resume is a standard procedure and most interviewers mentions one or two references in their resumes, but hardly any interviewer shows much of an interest in the reference and thinks of it as something to make the resume look good. In reality, references are as important as the resume itself and can really help both the interviewer and the interviewee. When it comes to emotional intelligence, references can really help the interviewer as well as the referrals because the employee who is already working within the organization knows how the company works and what are the work ethics of the company. So they can recommend someone who can be suitable for the job. Similarly, references can help you in determining how was the interviewee in his/her previous jobs and if he/she is suitable for the work in the organization. References also help in pointing out the behavior of the interviewee with colleagues at the previous workplace and it really helps in hiring for emotional intelligence. When an interviewer asks about the inspirations, dreams and role models it gives a chance to the interviewee to show insight into their personal thoughts and how they look at the world. Interviewee’s inspirations and dreams also show the mindset and how emotionally intelligent they are. Actually inspirations, dreams and role models are those things which came from deep within us and show how we look at the world as well as what kind of a person we are. There are researches about these things and proves again and again that a person’s dreams and inspirations are the reflections of their own personality and emotional intelligence. When an interviewer asks questions about such things, interviewee is bound to answer and the answer gives the chance to the interviewer to know more about the candidate at a more intimate level. Emotional intelligence is not something you can measure by the measuring tape or by looking at the academic records, but a person needs to have the emotional intelligence to know what they are looking for. In this article, we had tried to help in determining the emotional intelligence of an interviewee so that you can hire a more suitable candidate for the job. It is not the easiest task because most interviewers lack the skills needed to check the emotional intelligence of the candidates. We really hope this article helps you and the organization not only in hiring but in accessing the employees as well.